6:30 PM Mrs. Brown'S Boys D'Musical? 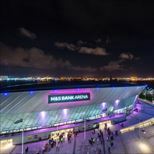 M&S Bank Arena is Liverpool's leading music and entertainment venue, located on the city's famous World Heritage waterfront. Since it first opened its doors in 2008, the arena has hosted a range of high profile events including the MOBO Awards, the MTV Video Music Awards and BBC Sports Personality of the Year, as well as global acts such as Beyoncé, Lady Gaga, Sir Paul McCartney, Queen and Stereophonics. M&S Bank Arena is a 20-minute walk from Lime Street or a short taxi ride. You can also transfer at Lime Street onto the underground Wirral Line trains to James Street station (10 minute walk) or catch the CityLink Route C4 (7am - 8pm) directly to the Arena. If travelling from outside Merseyside, you can catch an underground train to James Street station from Lime Street station, inclusive of the cost of your ticket. Ring Traveline Merseyside 0871 200 22 33 for up to date information about your bus, train or ferry service. The Traveline is open from 0800 - 2000 every day of the week. For all car journeys it's best to follow the white on brown tourist route signs for the Waterfront. These signs are visible on the major routes into the city. M&S Bank Arena is situated on the Kings Dock directly adjacent to the south side of the Albert Dock. Upon arrival, the Kings Dock entrance is clearly sign posted. From the North: Leave the M6 at junction 26 and follow signs for M58 Liverpool. Follow to end of M58 and then take signs for A59 Liverpool. Continue to follow Liverpool City Centre until picking up signs for the Waterfront. The Liverpool Waterfront Car Park is signposted 'Waterfront' on the city wide 'available spaces' signage. From the South: Leave the M6 at junction 21A and take the M62 to Liverpool. At the end of the M62 follow signs for Liverpool City Centre along Edge Lane, picking up and following signs for Waterfront. The Liverpool Waterfront Car Park is signposted 'Waterfront' on the city wide 'available spaces' signage. They offer a flat fee of £5 for parking for all M&S Bank Arena event nights. The Liverpool Waterfront Car Park is signposted 'Waterfront' on the city wide 'available spaces' signage. They offer a flat fee of £5 for parking for all M&S Bank Arena event nights. M&S Bank Arena is fully accessible for all customers and complies with DDA directives, with accessible toilets, lifts and entrances in all areas. Once you're inside the building the box office features a fixed loop hearing system, as do the refreshment and merchandising counters, which are situated at low levels to make life easier. An induction loop is available in some of the seating areas. Guide dogs are welcome in M&S Bank Arena . There are eight accessible toilets in the M&S Bank Arena; toilets are available on every floor of the building. Motorised scooters are allowed in public parts of the venue - you can also charge scooters and wheelchairs at the venue. You'll find accessible parking in the adjacent ACC car park, although it's not free for Blue Badge holders. There are plenty of accessible spaces in the car park, plus a drop off point on the river side of the centre if you'd prefer door to door service. Lifts in the car park have reversing mirrors and both visual and audible floor indicators. The route from the car park to the entrance is accessible to a wheelchair, although assistance may be needed as the route includes some ramps. If you have any questions about special seating requirements please contact the box office on 0844 8000 400.